Each element of the Universal matrix U (vertex-degree vertex-distance weighted matrix) represents the mutual contribution of two vertices weighted for the vertex degrees and the distance between them. 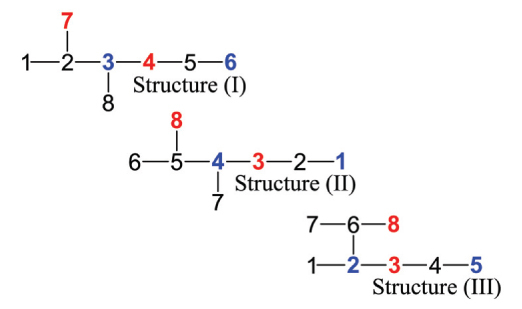 Regarding different labeling ways of graph vertices, particular matrix elements are not invariant to molecular labeling. Regarding the structural features they are invariants since there are only particular vertex combinations representing particular structural features. Some of the matrix elements are the best descriptors of a physicochemical property in question. Some combinations of matrix elements are very good descriptors of physicochemical properties of octanes regardless how we enumerate their vertices.